May 23: Rosie O’Donnell battles Elisabeth Hasselbeck on “The View.” Dan Abrams names the “winner” and gets post-fight analysis from The Huffington Post’s Rachel Sklar, The Chicago Tribune’s Amy Dickinson and commentator John Ridley. 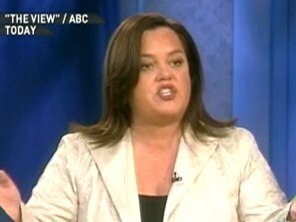 May 24: Donald Trump comes out on Rosie O'Donnell's side in her latest 'View' dust-up with co-host Elisabeth Hasselbeck. Rosie O’Donnell is not going out quietly, that’s for sure. This week on “The View,” Rosie hit an all-time low on many levels by going after her colleague Elisabeth Hasselbeck, calling her “cowardly” and saying that she didn’t provide “the facts” in one of the most heated, intense and personal TV fights you’ll ever see. Last week, Rosie attempted to make the argument that U.S. troops in Iraq were nothing more than terrorists occupying a sovereign country…except Rosie didn’t actually have the “courage” to say that. She asked a series of rhetorical questions, including “who are the real terrorists in Iraq?” Rosie caught tremendous heat for her comments, which must be considered on top of her other off-the-wall and unsubstantiated claims about World Trade Center Building 7 collapsing because of some still-unexplained plot/conspiracy on the part of the Bush administration. For Rosie to say outrageous and wacky things isn’t what’s news, and the fact that she’s leaving “The View” in just a few weeks would cause you to think she wasn’t much of a media story. Yet, this week’s on-air battle with Hasselbeck provided an interesting glimpse into how Rosie sees her ongoing battle with what she calls conservative pundits. Well, I’m not a conservative pundit; I’m just a media analyst who is convinced that ABC and Barbara Walters were irresponsible and short sighted in giving Rosie the powerful moderator seat of “The View” after Meredith Vieira left. Who came out on top, Rosie or Elisabeth? Did Rosie call U.S. troops terrorists? May 23: Rosie O'Donnell and Elizabeth Hasselback fought over Rosie's comments about the U.S. in Iraq. Hardballers Howard Fineman, Jill Zuckerman and Jonathan Capehart weigh in. Apparently when Rosie didn’t get the answer she wanted, that’s when she accused her co-host of being “cowardly.” Hasselbeck, who I’ve always seen as a pretty weak contributor to “The View,” finally stepped up to the bully in the playground, raised her voice and said; “Don’t call me a coward. I’ll tell you what’s cowardly, asking a rhetorical question that you never answer yourself!” Touché for Elisabeth. Rosie in fact was too cowardly to say directly and emphatically that she believed troops were terrorists, so she implied it through a lame series of rhetorical questions. That’s cowardly. And as for “facts,” consider this: In this truly fascinating on-air exchange, Hasselbeck stated: “I don't believe that you believe troops are terrorists. I have said that before. But when you say something like 650,000 Iraqis are dead…” Rosie interrupted, saying, “It’s true, you don’t like the facts!” That’s a good one. Rosie criticizing Elisabeth Hasselbeck for not liking facts is like Donald Trump giving advice on how to style your hair. It’s laughable. Rosie never has facts to back up her claims. And when she referred to the Vietnam War a few months ago and tried to make a point about the Gulf of Tonkin, all she said was you can look it up on “Google.” That was Rosie’s way of saying she didn’t really understand what the Gulf of Tonkin incident was about, and how it was connected to the point she was trying to make about the Bush Administration’s policy in Iraq policy. The funny thing about Rosie is that she sometimes has a kernel of truth to what she says, but it’s just that -- a kernel, a tiny piece, yet she takes that and makes these outrageous claims without any further evidence or FACTS. So finally, when she has nothing left to say, and a few days left to say it, she says she’s a victim because she’s a “fat lesbian.” Rosie, when I criticize you, it’s not because you are a “fat lesbian,” it’s because you are irresponsible and offensive. You are not that funny anymore, and I used to love you when you were. The biggest beef I have with Rosie is that she is in the television moderator’s chair for almost a year and has conducted herself like a buffoon. But again, Rosie’s not totally responsible for her actions because ABC and Barbara Walters knew what they were getting, so the ratings went up but the credibility of everyone involved has plummeted. Rosie’s sexual orientation and girth was never the issue, my sense is that she knows that and didn’t have the “courage” to have a respectful, yet spirited and honest debate with Elisabeth Hasselbeck or anyone else who has the gaul to disagree with her. Is 'Idol' on its last legs? Did Couric cross the line in Edwards' interview? Write to Steve Adubato at .